Credit union website design and web development process - from concept to completion. Having real impact starts with defining who you are, where you’re going and how you plan to get there. We use five core principles and eight proven methods to help us understand your credit union, your members' needs and your goals. Underlying everything we do is our endless pursuit of story - your story. Every credit union has one. We'll help you hunt it down and spread your message. We get to know your credit union and members through conversations and research. First, we listen. Whether we're working together to build a website that generates leads and elevates your brand or kicking off an inbound marketing strategy to help you reach revenue goals, our first step is to understand your credit union's story, what makes you different, and why that appeals to your members. This discovery step applies to nearly all of our activities and includes competitor analysis, benchmarking, and documentation of current processes to understand where you are now and how you should move forward. We achieve this by listening carefully and asking questions. We work together to define your goals and how to reach them. After we define your demographic insights, your business goals and your strengths, we work with your team to create a unified website design strategy that combines branding, marketing, and technology to help determine the future direction of your organization online. After we've completed the initial research, tactics, and metrics, and we understand your members, your products and your brand, we will have a clear plan of what your goals are and what we need to do to reach them. Next, as the design process begins, magic starts to happen. Now that we’ve defined your audience, goals, and the tactics necessary to reach them, it’s time to move on to the visuals, content and tools that will help you get there. From integrating the CMS, chatbot, and analytics to incorporating marketing automation and third-party integrations, our tech specs define how it all gets done. We bring your online marketing strategy to life through design and development. 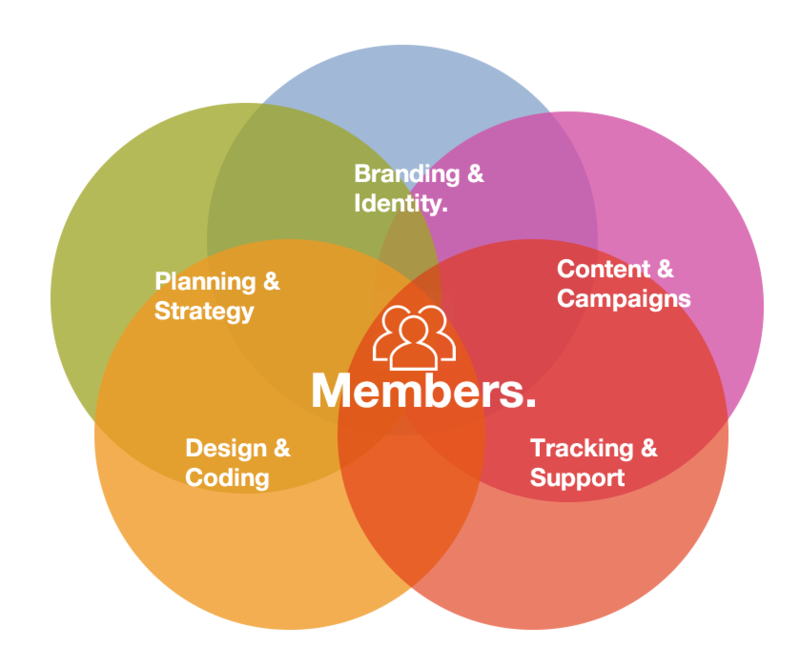 Whether it's the creation or evolution of your credit union's brand, we'll help communicate your story to members by mapping the user journey through your site from initial visit to conversion. To do this, we will plan the user experience with site architecture and wireframing and then proceed to design and development. During the design stage, we'll layer the visual identity (branding, concept, styles and colors) over the site architecture so you have a clear idea of what the final website will look like. After we've produced the final working website in a live testing environment, your team will review the site in its entirety and submit any necessary changes to text content, user flow and functionality. We'll make any final changes on our end and prep the site for deployment. After the website has been 100% completed, tested, reviewed and approved by your team, we'll coordinate the official launch date. We'll also schedule the CMS and AppSecure training and get you ready to manage the site before and after it launches. We monitor your online marketing performance through data. In this step, Avtec gathers reports on the metrics we’ve identified together as your credit union's key performance indicators during our strategy phase. Everything will be tracked and measured using a variety of reporting tools including Google Analytics, ADA Audit, HubSpot, Moz, SEMRush, SiteImprove, HotJar, and more. When Avtec works with your organization as a long-term partner, we provide regular reporting monthly and/or quarterly so we both know what’s working and what can be improved. Our team becomes your team in ongoing support and maintenance. After training you to manage and update your website with confidence, we'll provide you with User Guides, FAQs, tutorials, knowledge bases, and ongoing support. And, we'll always be just a click or call away to help you on your journey to success. We analyze your data to optimize, improve and reach new goals. To be effective, online marketing requires ongoing measurement, support, and adjustment. Avtec's team, who has become part of your team by this step, provides interpretation of data to give you clear guidance and innovative ideas and suggestions on how to improve results or aspire to new business goals.